When executable programs are run, they are controlled by a predefined process in the runtime environment, and a series of processes are called one after another. These proc-esses trigger events, for which event blocks can be defined within the program. When a program starts, certain events work in a certain order. This will display the screen to the user, and it can then be interacted with. Once this is complete, the ‘at selection screen’ event block will process the information, and this is where one can write code to check the entries which have been made. If incorrect values have been entered, the code can catch these and can force the selection screen to be dis-played again until correct values are entered. Error messages can be included so that the user then knows where corrections must be made. 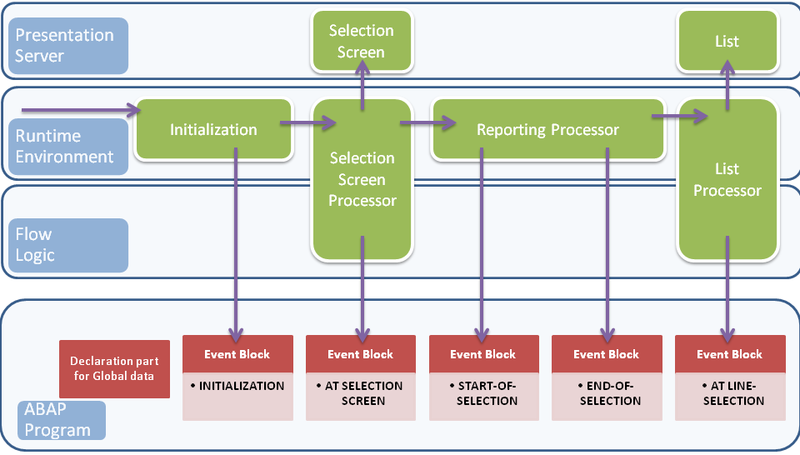 Once all of these event blocks have been processed, control is handed to the list proces-sor, which will output the report to the screen for the user to see. The list screen occa-sionally can be interactive itself, and the code in the event block ‘at line selection’ visible in the diagram takes responsibility for this. This chapter will focus on creating the selection screen and making sure the user enters the correct values for the report, as well as ensuring the selection screen has a good inter-face. Your blog is nice one. CCNA Training Institute in Chennai | CCNA Training Institute in Velachery.